Kleifarvatn is the biggest lake on the Reykjanes peninsula. 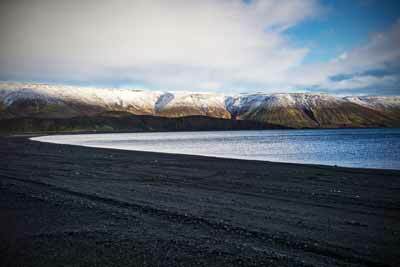 Only 30 minutes away from Reykjavik it is perfect to include in a shorter day tour around the Reykjanes peninsula. The tour can end or start at the airport and can be done in 5-6 hours. This is ideal if you have an early arrival so you reach your hotel once you are able to check in. Also if you have a later departure to use your time after having checked out of your hotel in Reykjavik. When reaching it from Reykjavik you drive through the towns Garðabær and Hafnarfjörður before making a turn land inwards. Before you reach the lake you have to drive along some lava fields using some non-paved roads. By the lake you have multiple spots where a safe stop is possible to take some pictures and breathe in the landscape. If you have time you can of course also go for a hike. Such as many attractions in the area it is located in the fissure zone of the Mid-Atlantic Ridge. It is not connected to any river or other visible flows. The water of the lake mostly comes and leaves underground. Reaching a depth of up to 97 meters the lake has diminished and lost about 20 % of its surface after two earthquakes in the year 2000. Not far away you find other attractions such as Krýsuvík geothermal area and the bridge between the continents which usually also are components of a day tour around Reykjanes. These tours also can include the fishing village Grindavík, Reykjanesviti ( Iceland´s oldest lighthouse). You can of course also combine a visit to Reykjanes with a visit to the blue lagoon. In this case just remember to book it in advance.